Mac OS X Lion’s App Resume feature is both loved and hated. Most people seem to love the feature for most of their apps, but don’t want it enabled for others. Up until now, you’ve had to issue either app-specific defaults write commands or lock saved states folders, or just disable Resume completely. These are all effective methods, but what if you want to easily manage OS X Lion’s Resume feature on a per application basis from a GUI? Resuminator does just that. It’s an easy to use and free app for Mac OS X 10.7 that lets you individually select applications and whether or not they will use Resume. Want it enabled for Chrome but not Safari? No problem. The app is extremely simple. Select an app, and uncheck the box next to “Should Resume” if you don’t want that app to Resume it’s windows and states. The “Global Resume” checkbox turns control back over to the general System Preference that disables the feature. 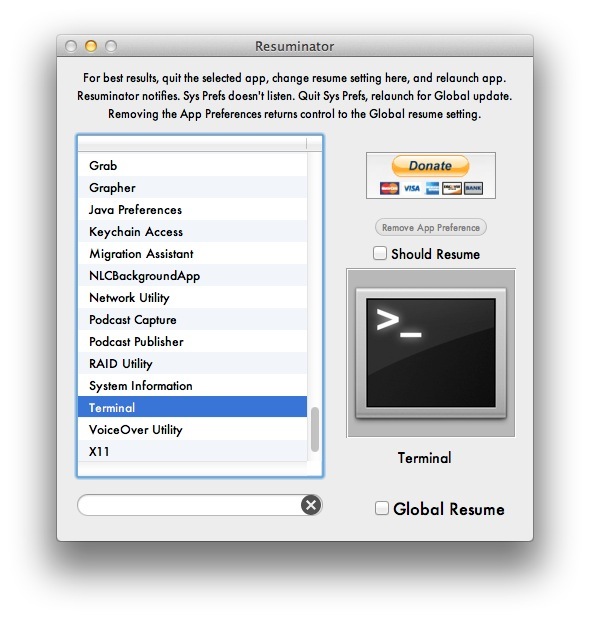 Resuminator was created by Mac developer and occasional TUAW contributor Erica Sadun. It likely just serves as a GUI front end to the aforementioned defaults write commands, but it’s in a much easier to use format. i find it interesting that the two apps specifically mentioned in regards to the resume feature in this article are browsers ;). maybe it is sad that the first thing i thought of when i saw this was Terminal and not something more interesting, but the fact remains that when i quit Terminal with 6 windows open it’d be great to not have all of them come back when relaunching. Why does this app start out with every single app set to not resume? One would think in a default Lion setup all apps ARE set to resume. I backed away and deleted app. Every app was set not to resume because your general system preferences were configured that way when you downloaded the software. I prefer the defaults write method since I can control everything myself. I’m wondering the same thing.. I got this program specifically to tell a few programs not to resume, but everything is already turned off.. Not sure exactly how to use this, or if by opening this up, it automatically disables everything already? I don’t want to mess around too much without knowing what it’s doing. @911 I didn’t change anything thing in the app and quit it and deleted it. Thankfully it hadn’t changed anything. But I won’t be installing it again as I think it is odd that it showed all apps already disabled when they were not. The “Restore Windows when quitting and reopening apps” switch in System Preferences…/General functions just the opposite on my computer as it does on my wife’s. This app doesn’t work on my MacBook Pro with OS X 10.7.1 – when I launch it I don’t see any apps in it and there is no way to import or drag them in. What give’s? By default, the app has no overrides. All it does is add “no resume” preferences to individual apps.